YUMMY... IM DROOLING! 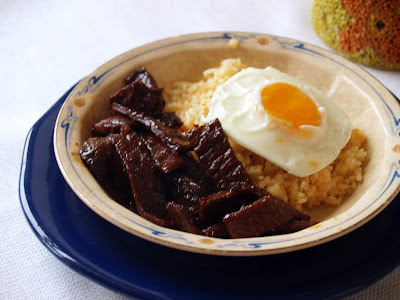 I miss my tapsilog! Malou this is wrong... it's almost midnight and I'm desperately in want for tapsilog! What is beef sabor powder? hi Raks thanks for coming over. The beef sabor powder is a bouillon powder and it's simply a broth powder that you buy in a pack or bottle at the grocery store. I remember reading Winnie the Pooh to my kids too and how charming and witty their lines are. I'm glad i got a little help from them writing my post. Happy Sunday! That is one hearty, and beautiful breakfast, Malou! 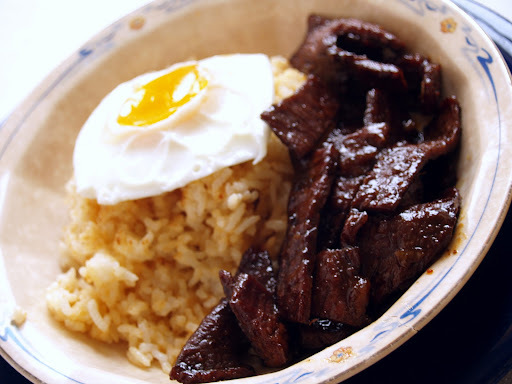 I can only imagine how tender the steaks are, the rice, and a perfect sunny-side egg on the top! Hubs and I usually have this kind of breakfast on weekends. Nothing beats like it. Great to see you Elisabeth! Oooooooh! Your posts are killing me! Sooooo good! My mom loves tapsilog! My 3 year old daughter loves longsilog. I'm a fan of tocino, myself! :) Ohhh...filipino breakfasts are the best! Great post! Thanks for sharing!! The best garlic rice ? In the same pan where you cooked your tapa add olive oil to brown your garlic then put in your rice.